If you’ve been toying with the idea of adding a smart lighting solution to your home but the high prices of Philips Hue products has been a barrier, we’ve got a great alternative for you to check out. The Eufy Lomos line by wildly popular electronics brand Anker is loved by just about everyone who tries it, and Anker is running a great sale today that saves you money on its two most popular smart light bulbs. 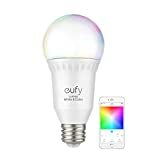 The $18 eufy Lumos White Smart Bulb By Anker is on sale for $13.99 with coupon code HXBRFZNN, and the $35 eufy Lumos Multi-Color Smart Bulb By Anker drops to just $25.99 if you use the promo code NDBR4PZZ at checkout. The are both fantastic prices on smart LED bulbs that work with both Alexa and Google Assistant — no hub required. Voice-Controlled Illumination: Amazon Alexa and the Google Assistant compatibility let you control your lights absolutely hands-free (Alexa and Google Assistant devices sold separately). Access From Anywhere: Whether you’re at home or away, dim and brighten the lights from your smartphone or tablet with the free EufyHome app (Android 4.3 and above or iOS 8 and above devices required. 2.4GHz Wi-Fi network support only). 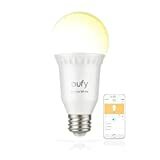 What You Get: eufy Lumos Smart Bulb – White (2.56 x 2.56 x 5.5in), User Manual, Safety Instruction Card, Happy Card and our worry-free 18-month warranty. What You Get: Lumos Smart Bulb – White & Color (2.56 x 2.56 x 5.5in), User Manual, Safety Instruction Card, Happy Card and our worry-free 18-month warranty.